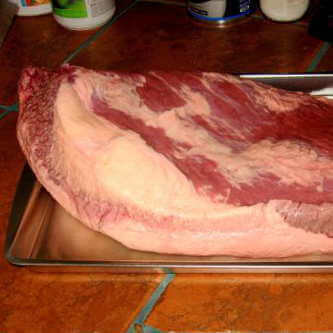 The whole beef brisket is a large cut of meat that is taken from the chest area of the butchered steer. The whole brisket has a large amount of fat, part of it internal and the rest found as a layer on one side. A good brisket will have fat marbled throughout the meat, which helps keep the beef tender and juicy. 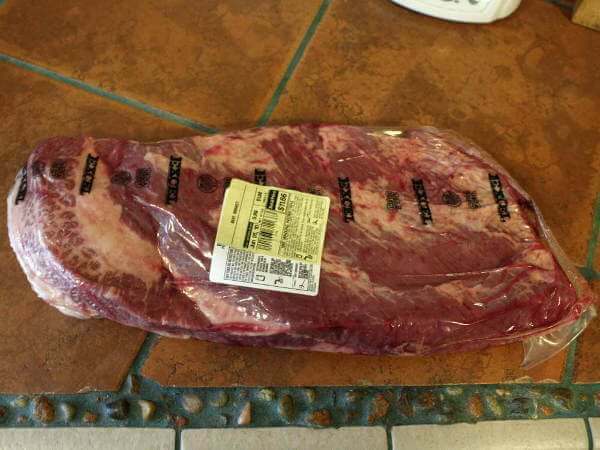 Brisket also contains quite a bit of connective tissue because the two muscles of the brisket are worked as the steer stands or moves around in its daily routine. The tissues make the brisket tough if it's not cooked long enough to break them down. Smoking for hours at relatively low temperatures is a great way to do that. And when the connective tissue softens and melts, it adds rich flavor to the meat and makes it nice and juicy! 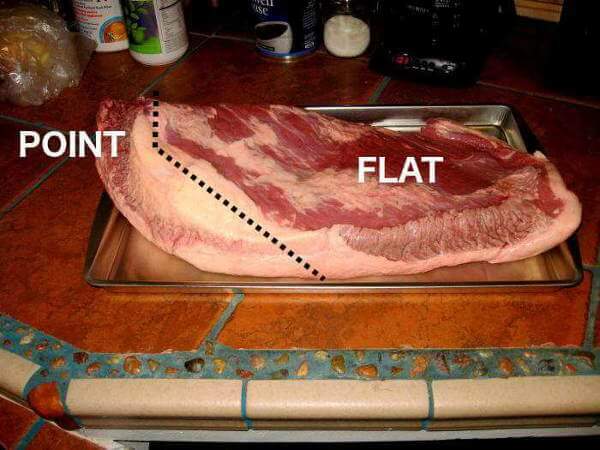 The brisket you see below shows of the flat and the point muscles, which are separated by a layer of fat. 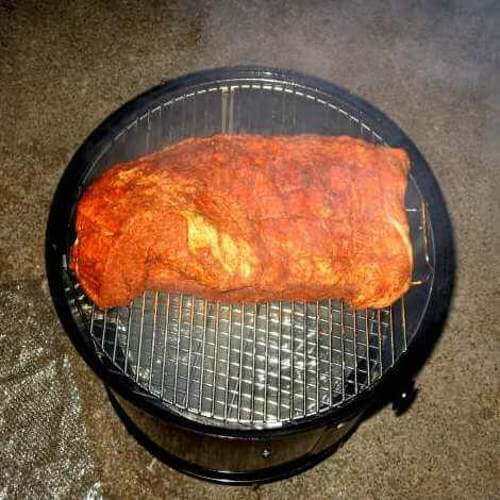 The dashed lines delineate the two muscles of the whole brisket shown in the following two pictures. Still looking at the above picture, the layer of meat you see on top is the brisket flat. You can't see it in this picture, but laying under the flat on the left side is the point, which is the second muscle of the brisket. In the next picture the point is a little easier to see. On the right end of the brisket you can see how the grain direction of the point is different than the grain of the flat. There's a narrow vertical line of fat separating the two muscles. Shorter smoking time and improved flavor are two benefits of separating the two brisket parts before they're seasoned and smoked. Dividing the two muscles exposes more surface area, which means you can apply more brisket rub, and that there's the potential for more smoky flavor. The two smaller parts will also cook a bit quicker in the smoker, and each part can be removed from the smoker when it's perfectly done. 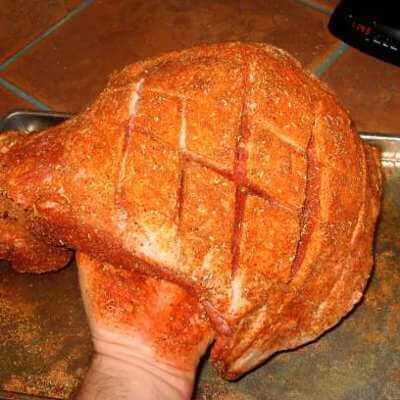 The point, being a fattier cut, is usually better if smoked a little longer than the flat section. To divide the two sections, simply let the fat layer between the muscles guide your sharp knife. Try to leave an even thickness of fat on each of the pieces with making the cuts. 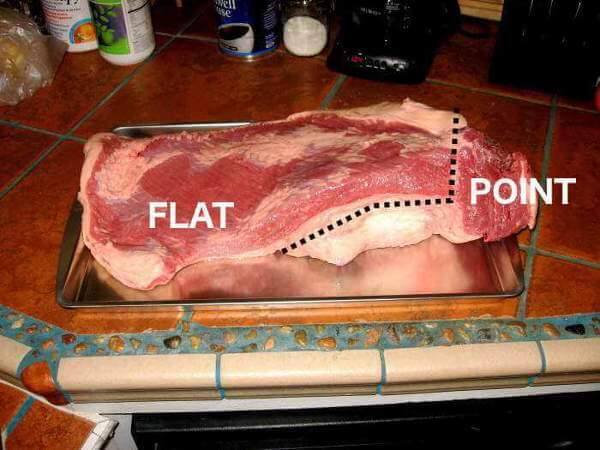 The flat is a leaner muscle, and is usually less moist and a bit less tender than the fattier point. The brisket point is the more tender section of the whole beef brisket. It contains a bit more internal marbling than the flat, making it more juicy when cooked. When the brisket is all cut up and displayed on the serving platter, the point is the part that disappears the quickest in my house! You may come across the word "deckle" in your brisket studies. Deckle is simply another name for the point. The word is sometimes spelled deckel. And to add complexity to this name game, in some areas the point is called a brisket "second cut". 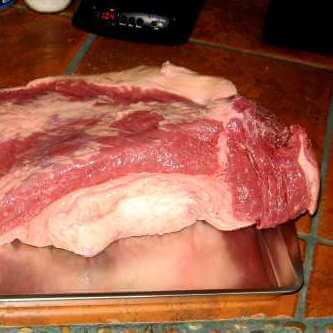 There is a layer of fat on one side of the brisket which can vary in thickness. 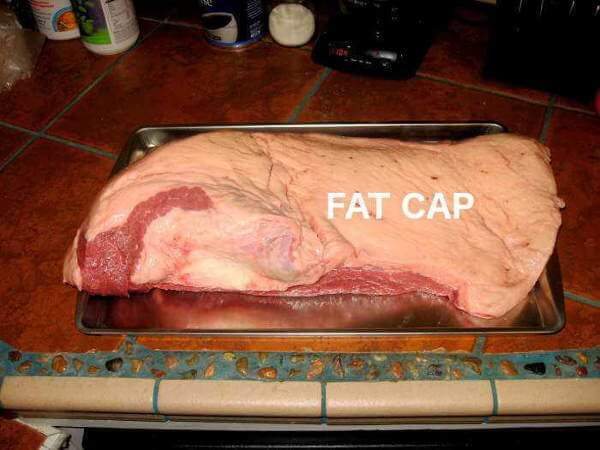 In the picture above you can see the fat covering the top side, which is commonly called the fat cap. On the left end, the meat you can see showing through the fat is part of the point peeking out. Before seasoning, it's usually recommended to shave the fat cap down in thickness to somewhere between 1/4 and 1/2 of an inch, though many seasoned smoke cookers don't feel that trimming is required. Whether it's trimmed or not, the fat melts as the brisket is smoked, the flavor filled juices running down its sides. Not much of the molten flavor reaches the underside of the brisket, but every little bit helps! To allow the brisket rub flavors and smoke to reach the meat on the fatty side, I often score the fat in a criss-cross pattern, so the cuts just reach the meat layer. Looks good that way, too!